Aikido Tankyu Magazine : “Half of Aikido’s Keiko (practice) is Uke. Depends on how you do Uke, the quality of practice will be very different. We asked Shihan (Instructor) of Hombu-Dojo what we have to take care during the practice to have fruitful practice”. In the Aikido’s practice, not only Tori but Tori and Uke achieve one technique helping each other. Why say this, because the movement you want to achieve is very difficult to do at first try. Tori makes practice with Uke’s gentle response again and again, and then Tori will progress little by little to make ideal movement. So, I want the beginner to become get use to be thrown. Normally, it is not good experience to be thrown by someone, but it is necessary to enjoy to be thrown to continue the practice. For that, Tori have to take care to throw the beginner not giving scary feeling. Instructor needs to watch students’ behavior carefully and if it becomes dangerous, he needs to give advice or give caution. The responsibility of instructor is very important. 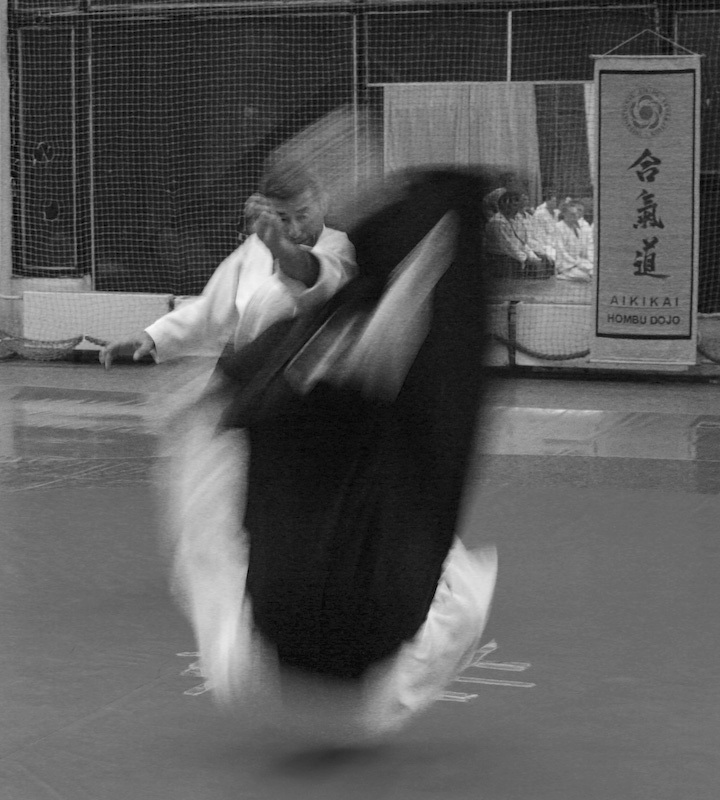 For the beginner, it is important to remember the Aikido technique movement roughly as soon as possible. If someone says you should fall, beginner cannot understand why it is necessary to fall. 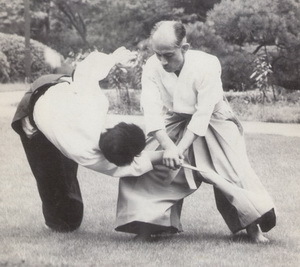 If you can understand the relation between falling and the technique, then easy to guess what kind of Ukemi is needed. “Making Uke just for Ukemi” does not help progress of Ukemi technique. During your progression, it is necessary to be able to make Uke for different Tori who has different speed, different power. Because Uke cannot exist without Tori’s movement, Uke should move without blocking the movement of Tori. The Uke should adapt his movement every occasion. This will be related to the practice method. It is not good practice if Uke tries to hold on too much. 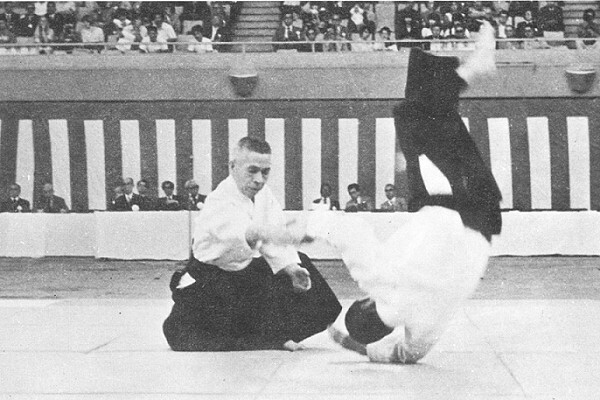 Because Aikido’s practice is pre-defined techniques, next movement is known. It is easy to block the movement in this circumstance. But that does not lead to good progress. Apart if your goal is tackling and knock down but to acquire good movement, it does not work. I often see a person who block the Tori’s movement saying this is teaching and training the Tori, but this is not good way of practice. After all, it is necessary to move even the body does not respond with your age. For the practice, it is better doing Uke without comment than too much explanation. He comes to Dojo for practice as well; it does not help himself. Skillful persons may remember two or three techniques par day, but only the procedure of techniques. Even you know the procedure of technique, you cannot understand the feeling of technique without doing Uke. By many experience of Uke with senior person or with junior person, you can understand your Tori movement was good or not. In the practice, doing Uke with respect counter person, it result bring out the Tori’s best. When you do Uke, if you feel Tori’s movement is good, you can try that method when you do Tori. Repeating and accumulating such things are the every day’s practice. 1. Are you aware of the Uke is the offensive side? 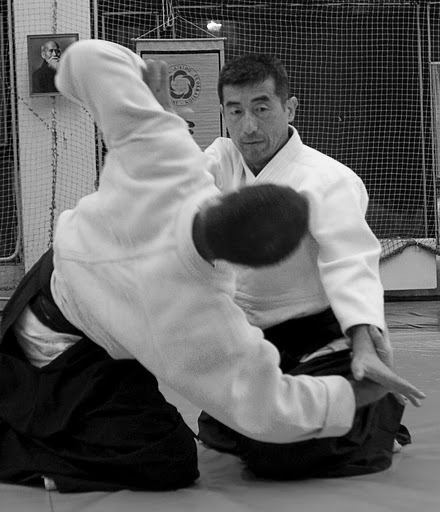 To take hand or Uchi are offensive movement. You can not hold if there is nothing to hold, Uchi which does not reach to the Tori’s head is nonsense. The moment you attack, it is necessary to have good posture. No way to start attacking with bad distance, bad timing or unbalance position. Uke will fall by Tori’s force. Don’t make Ukemi without feeling Tori’s force. 2. When you hold the hand, do you hold from the little finger? If you hold tight with a thumb and a forefinger, it is easy to loose the holding. Hold from the little finger, and stick to Tori’s hand. Tori moves not to break the relation with Uke, and Uke moves follow the Tori not break the relation. 3. Do you change the holding power during the technique? When Tori is moving, if Uke changes the holding power during the technique, the movement of Tori is disturbed. You can hold strong or soft, but keep the same force and follow the Tori’s movement. If you change the holding power, it is not only disturbing the Tori’s movement but also your response become worse. 4. Do you make movement with all the body? Not stopping the movement by arm or by shoulder? Don’t stop the movement by putting force at shoulder or arm. In case of Katate-Dori or Ryote-Dori, I often see the people fix the elbow or the wrist. Transmit the force from the contact point to all the body. Even your body is larger than Tori, don’t stop and receive the force by all the body. 5. Do you keep your contact point to the Tori in your sight? When you make movement as Uke, Keep your contact point or holding hand in your sight. Not stare that point, but more broad view. If your head is not pointing to the connected place, it means you are just chasing the movement and not martial. If you look at the direction of falling, then your falling will be too early, (or you are falling by yourself) If you try to keep looking, your center of body will direct to the contact point. If you look until last moment, then your body can follow as well. 6. Don’t you make lazy Uke? Lazy Uke means for example, if you make Uke for Shiho-Nage, then you just think about Shiho-Nage and you move by yourself not by force from Tori. In that case, if Tori changes the technique, you cannot follow. Don’t make lazy for any person, don’t be lazy and polish your feeling. When I started to be instructor, I am prepared for making Uke in case senior instructor calling me. The impression of Uke for each instructor is very much different. And I still remember those impressions. I made Uke lots for Kisaburo Osawa Sensei (9th Dan). I cannot express well, but there is no collision in the movement, and when I made Uke I feel myself purified. Of course during making Uke is not easy. I don’t know what is next technique and how. It is necessary to respond any movement. But all the experience from senior instructor are still in my memory, and very important for me. So I would like to throw my student as much as possible.